The hay press compresses the hay - so more can be stored in the same space - and turns it into "bales". The front wheels are removed and the back wheels swing forward to lower the press to the ground. The hay is loaded into the hopper, the horse walks in a circle to operate the plunger that compresses the hay, and the finished bales come out the back. This one-horse press could bale about 1000 pounds of hay an hour. Widely used by 1880, it was powered by gasoline engines in around 1910. By the 1950's hay bailer machines both picked the loose hay in the field and bailed it in one process. After the hay was picked up from the windrow in the field and put on a wagon it needed to be stored. This was done by lifting it into the second floor of the barn, with everyone walking on the hay to compact it as much as possible. The ability to store a larger quantity of hay in the same space would allow for more animals to be fed longer. 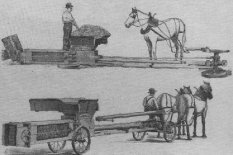 Hay presses were built prior to 1880, but they were seldom seen until after that time. The press would be driven from farm to farm. Upon arrival they would be lowered to the ground by removing the wheels or digging a hole for the wheels. The hay would be placed in to the hopper from the hay wagon. The horse would then walk in a circle, turning a cam, which pushed a plunger into the chamber. This compressed the hay was 1/4th to 1/8th of the original bulk. A one-horse outfit could bale about 1000 pounds an hour. It took about six people to operate a medium-sized hay press. Two people fed the baler, one tied the bales with twine, another removed the finished bales and extra hands were needed to tend the horses. Often, a farmer would bale any hay remaining in the loft so there was room for the new crop, or for sale. A common saying was that "You can never have enough hay!". As a matter of semantics, the term "hay press" was used well into the 1930s. A gasoline engine replaced the horse beginning in 1910. Occasionally, the term, "baler" occurs prior to that time, but it refers to field machines that picked up hay from the windrow. 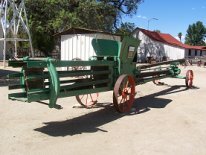 Balers did not become widely accepted until after World War II. To lower our press to the ground the front cotter pins are removed and the wheels slide off. The back wheels are on an axle which swings forward with releasing the hooks. The plunger is pushed by rollers as the horse walks in a circle. Wood dividers are placed between the compressed bales to allow for tying with twine.